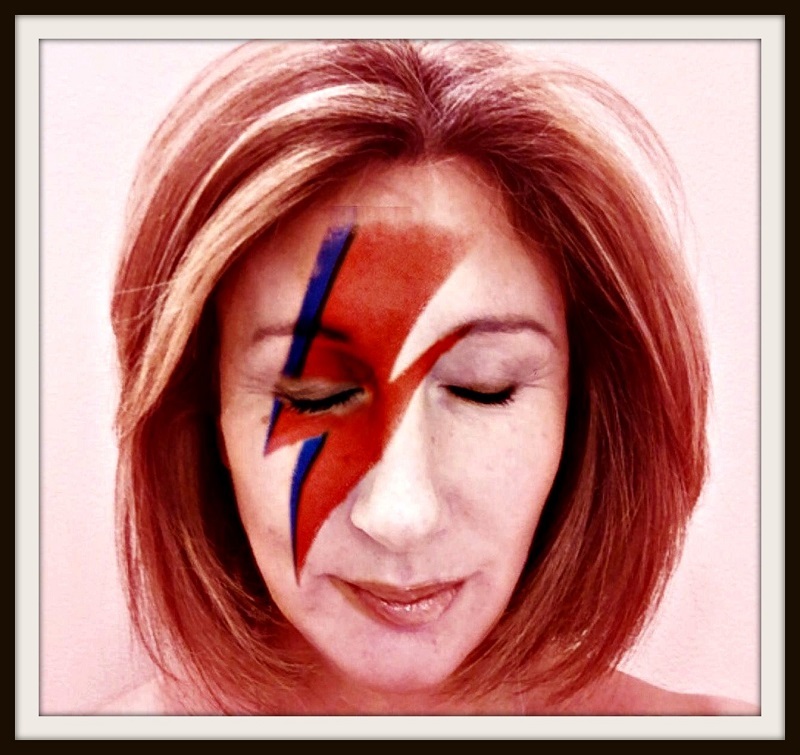 You may not think of Jane Green — the best-selling author/co-founder of the “chick-lit” genre/TV and radio personality, and a devoted Westporter — as a David Bowie fan. She’s not only a longtime admirer of the late musician/actor — she’s organized a concert here in his honor, to benefit his favorite charity. I was 12 years old when I discovered David Bowie. On the eve of my birthday, a girl gave me the album “Space Oddity.” It was my 3rd album, and I religiously collected the rest of his. I saved up to go to the HMV on the Finchley Road after school, until I had every album he had ever made. My bedroom, at the top of an old Victorian house on a leafy street in Hampstead, was a shrine to David Bowie. One wall was covered with posters, complete with staple holes and creases from where they had been folded up inside the pages of a magazine, another covered with a huge mural I had painted, copied from the cover of “Scary Monsters.” On the floor was a turntable, with a stack of his albums next to it. I was swept up in a completely obsessive, overwhelming, adolescent first love. On the morning of January 10 this year, I was woken to a stream of messages from girls I hadn’t spoken to for over 30 years. All reached out to me from across the Atlantic, where they had heard the news several hours earlier than I. They wrote to tell me they remembered my mural, my obsession, my love for David Bowie; they wrote to say that they were simply communing with me on this tragic day he died. Grief builds. My initial sadness was nostalgic, and brief. As the days rolled on, filled with news stories about his passing, I found myself growing more and more sad. I watched videos of hundreds of my fellow Londoners gathering outside David Bowie’s birthplace in Brixton, a couple of them strumming acoustic guitars, as the huge crowd broke into song, knowing every word, every line. How I wished I could have been there. Jane Green channels David Bowie. My friend Fiona emailed to say she wanted to go somewhere and remember him, have a sort of interactive memorial. “There are lots of us feeling the need to hear him again in a group – and sing along with him and sort of be together in a mutual lovefest and nostalgia,” she said. It was exactly what I wanted to do, to celebrate the life and legacy of a childhood idol who was so much more than merely an idol. This suburban boy who prowled across the stage like a charismatic alien, his hair spiked red, his eyebrows gone, his voice like nothing I had ever heard, was the most beautiful, and unusual creature I had ever seen. His uniqueness spoke to all of us awkward kids standing just outside the mainstream. He made it okay to feel a little different; he made it okay to not quite belong. David Bowie gave us permission to be whoever we wanted to be. I needed to celebrate, and remember, and grieve, and sing. There were clearly many more who felt the same way. I approached the Westport Country Playhouse first for the space, before the radio station 95.9 The Fox offered to sponsor. The evening started to come together as a warm, intimate, nostalgic evening in the Playhouse barn, an evening of Bowie songs played by local musicians, lyric sheets available for those who want to sing along. Musicians we have confirmed so far include Diane Scanlon, Jerry Vigorito, Pat Lattin, Nicholas Devine, Dennis Dobson, Kim Manning, Linda Couturas and Adam Riegler (a Staples senior who has appeared on Broadway in “The Addams Family,” who will be bringing his group). I posted on the “Westport Front Porch” Facebook group, asking if there were any Bowie fans who might help organize this event. An extraordinary group of people came together, all Westporters, all of whom have loved Bowie for years: Jamie Camche, Jennifer Clement, Mary Dobson, Marita Driscoll, Fiona Garland, Jerri Graham, Michele Harding, Darcy Hicks, Jennifer Lupinacci, Kathy Oberman, Sam Pattinson, Andrea Pouliot-Rourke and Russ Hardin. As always, our local businesses have been generous beyond measure. The Granola Bar, Matsu Sushi, Sushi Gusto at Fresh Market, Positano and International Wine are all sponsoring this event with food and wine. We, in turn, are donating all proceeds to David Bowie’s charity of choice, Keep a Child Alive, whose mission is to bring about the end of AIDS for children and families. Since January 10 I have once again immersed myself in all things David Bowie. I have listened to the music, sung the songs, read the books and watched the videos. I have taken a trip down memory lane with the thin white duke, which all us Bowie fans will be doing, together, at the Westport Playhouse on March 8 at 7 p.m., along with my 12-year-old, who is just now discovering the magic, and obsession, of David Bowie. This entry was posted in Arts, Entertainment, Media, People, Westport Country Playhouse and tagged David Bowie, Jane Green, Westport Country Playhouse. Bookmark the permalink. Nile Rodgers, (Chic) is a Westport Resident. He wrote and/or produced most of Bowie’s music. In fact at the Grammies this year, in the tribute to David Bowie, Nile was on stage with Lady Gaga playing his Bowie music guitar. Wish I could join you on March 8. Anyone planning to film this event? I’ve been looping David Bowie on my iPod. There will never be enough Bowie. I had a similar experience! 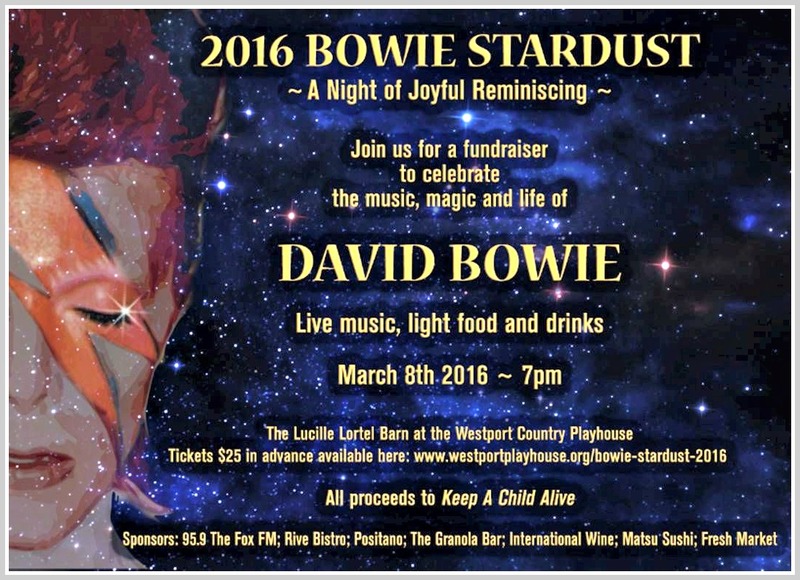 I was one of the very few people I knew growing up in Westport that adored David Bowie. College friends that I have not spoken to in over 25 years began reaching out to me after Bowie’s death. Thank you for putting this event together!! Should be lots of fun. How fabulous!! Congrats to Jane for getting this going and donating to his charity of choice. Bravo.